An engagement ring may be the most important piece of jewelry you ever buy. Especially if you’re planning to surprise your soon-to-be fiancée with the ring and proposal, you want the perfect ring, one that will sweep her off her feet. For maximum dramatic effect, consider buying a marquise diamond engagement ring. What is a Marquise Engagement Ring? Marquise refers to the cut and shape of the diamond used in the ring. A marquise stone is elongated and pointed on both ends, something like a narrow football. Legend says King Louis XIV of France had the marquise-cut stone created during the 18th century. He wanted to have a ring made for his mistress, the Marquise de Pompadour. Supposedly he was so entranced by her smile that he commissioned a new shape of stone, one that would remind him of the sweet curve of her lips. While today the stone is worn vertically rather than horizontally, you can still see the inspiration for the cut in the lines of the marquise diamond. 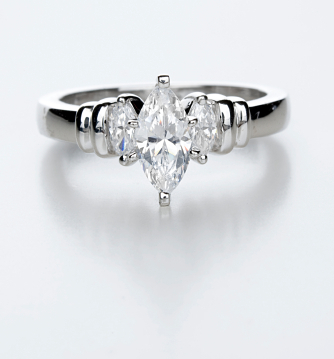 The story adds a bit of passion to a marquise engagement ring, making it a great choice to give to the woman you love. Marquise diamonds come in any size, from a 1/4 carat to 5 carats or above. A nice feature of marquise diamonds is that the cut tends to make them look larger than they actually are, so even a small marquise stone can look quite impressive. The ideal ratio for a marquise diamond is 2-to-1. That is, the best marquise stones are twice as long as they are wide. However, you can find rings with stones in other ratios, either narrower or wider, if that’s your preference. Marquise diamonds tend to be less expensive than comparable weight stones in other cuts. This is because the shape of the stone allows the maker to cut around flaws in the original diamond, meaning it’s not necessary to start with a perfect stone. You also may be able to spend less on a marquise engagement ring because you can buy a smaller stone and get the same effect as you would with a larger stone in another cut. You can adjust the cost of your ring by choosing a lower cost metal for the band, too–yellow gold tends to be the least expensive, platinum the most expensive. The price range for a marquise engagement ring varies widely. You could spend under $500 for a small stone up to $5000 or more. Many women love marquise engagement rings because they have a lovely slimming effect on the fingers–the elongated stone makes the finger look long and skinny. Also, for small women, a marquise ring can look impressive without overwhelming a tiny hand. Marquise stones are especially good as a centerpiece surrounded by other stones. The shape of the stone lends itself to smaller, complementary gems on either side. They also work well as part of a bridal set, with the wedding band nestled around the marquise stone. As mentioned before, if you’re on a tight budget, a marquise stone allows you to buy a more impressive ring than you’d otherwise be able to afford. This cut is the best way to get the most for your money. Another reason many women love marquise engagement rings is the combination of tradition with an unusual twist. A marquise ring has a classic look without the predictability of a round stone. With a marquise diamond, it’s especially important that the prongs be well placed and secure to protect the tips of the stone from damage. The most common setting is what’s known as the Tiffany setting–six prongs, with two on each side of the stone and one covering each tip. You may also find marquise ring settings with eight prongs. Marquise engagement rings are often elaborate settings, with many small stones surrounding the centerpiece or as part of a set with other bands, but you can also find stunning marquise solitaires. When you’re shopping for a marquise engagement ring, you’ll want to look especially for a stone with high quality color and clarity. The marquise shape can accentuate minor flaws in the stone. You can sacrifice a bit on size to get a better quality and the shape will help it to still look impressive. Also, because of the ability to cut around flaws when cutting a marquise diamond, the smaller stones may be higher quality. One of the most common problems with marquise stones is the potential for a so-called bow tie effect. This is an area in the middle of the stone that may be darker or less brilliant that the edges, due to the flat section without facets. You’ll want to look for a stone with depth to the cut to minimize this effect as much as possible. As with any engagement ring, you should always check the prongs to be sure they’re secure and make sure the stone is centered. With a marquise diamond, it may be especially noticeable if the stone is tilted slightly. Make sure it runs parallel with the finger, or, in some antique rings, parallel to the band. The major drawback to a marquise engagement ring is the aforementioned bow tie effect. You can minimize this by shopping carefully and knowing to look out for it. For some women, the pointed tips of the marquise stone may be a drawback, as they might have a tendency to catch on things. Most retail jewelers carry marquise diamonds, as they’re a very popular option. Many online jewelers offer them as well. You may be able to find a better deal for the same stone online, as online jewelers don’t have to factor in the overhead cost of a brick and mortar store. If you decide to buy online, though, you need to research the shop to make sure it’s reputable–many scammers set up online storefronts. Check any store with the Better Business Bureau before you buy. Blue Nile is a good online jewelry choice. In the end, buying an engagement ring is a very personal choice, and you should look at many styles before you decide which one is right for you. But for a combination of impressive effect, lower cost and unique setting options, you’re not likely to find any ring that measures up to a marquise engagement ring, the only ring created to look like a lover’s smile. What a beautiful way to begin your life together.